Set in the heart of the largest conflict in human history, Among The Red Stars is a historical fiction novel with real roots in the Second World War’s Eastern Front. Valentina Grizodubova is a young pilot with large shoes to fill. Although she dreams of becoming a pilot for peace, her life is thrust into war when Joseph Stalin’s infamous Order 227 is decreed, demanding “Ни шагу назад!” or “Not one step back!” Valentina, being called upon to defend her motherland, joins up with the USSR VVS air force. With her life constantly in danger, she must make snap decisions to save her life as well as that of her navigator, Iskra. With each engagement coming closer to her death, Valentina’s life is in constant peril. 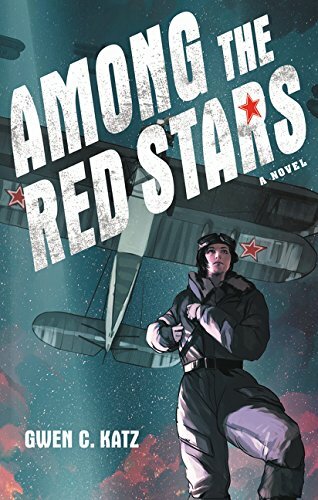 Filled with action, danger, and the constant fear of the NKVD, Among The Red Stars is an authentic tale of the Great Patriotic War. The author, Gwen C. Katz, does an amazing job of bringing the characters to life. With many historically accurate conflicts being represented, it is not hard to admire the amount of research that she did for the book. In addition, the coverage of the darker side of the Soviet Union during the Second World War was refreshing. It was more than just nice to see that modern-day novels celebrating the soldiers of the USSR do not confuse them with the many harsh policies and human rights violations the USSR state practiced. Still, the novel lacks coverage of the Soviet push into Germany. It largely glosses over the uphill battle into Berlin, and it would have been nice to see the offensive side of the Eastern Front. However, overall this novel is a very solid book, and it would definitely be a good book for anyone that enjoys history and novels. 4/5 stars.